As a compulsive recycler, I just don't like to throw away old calendars, so here are the Moosey Calendars for 2014. First, my Cats Calendar, in which all seven cats - Tiger, Fluff-Fluff, Histeria, Percy, Lilli-Puss, Minimus, and Little Mac - are featured in garden photographs. Tiger even gets her picture taken with a batch of garden gnomes! 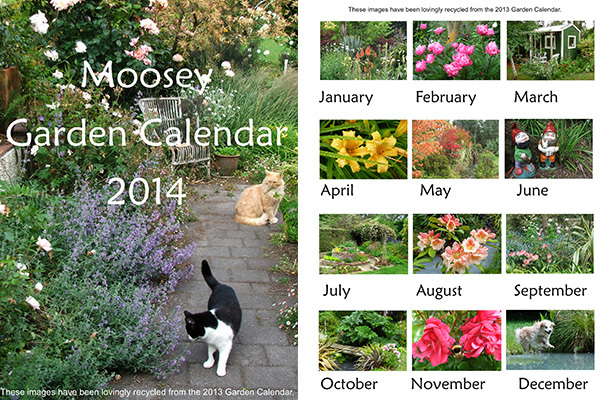 My 2014 Moosey Calendars are in a PDF format, easy to download and print. There are fourteen pages in all. Some folk like to print off one month at a time for their noticeboards. But the full file is quite large, so I've split the calendar into two parts to make things a bit easier. They are here below. I hope you'll enjoy the pictures - you'll see images of each page below. 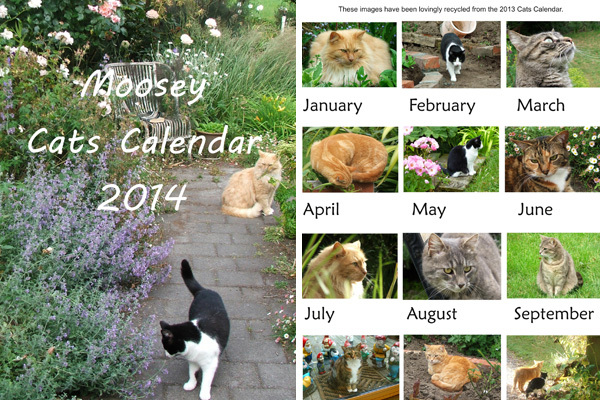 Please enjoy sharing my garden cats with me throughout the year. 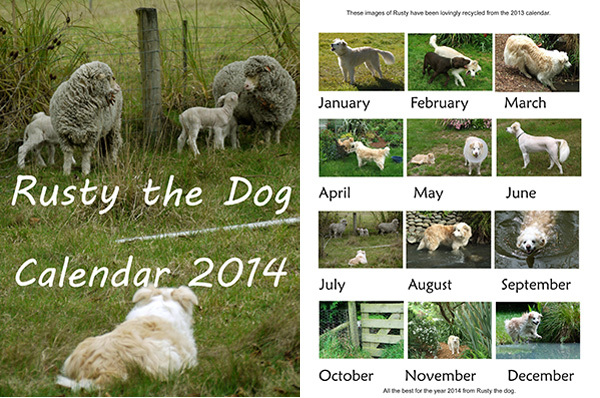 Here is the 2014 Moosey Dog Calendar, free for you to download, print, and enjoy. But only if you like dogs! The full file is quite large, so I've split the calendar into two parts to make things a bit easier. They are here below. There's absolutely no charge for this Moosey Calendar. I hope you'll enjoy the pictures - you'll see images of each page below. Please enjoy sharing my garden with Rusty the red Border Collie throughout the year. Below is a beautiful archive Garden Calendar which I made for 2014. I've always loved sharing my garden with others, and I've always made personal calendars for my friends and family. It's a pity that old calendars aren't as easily recycled as old roses are! The photographs include garden additions (like the brick herb spiral) as well as old faithfuls - gnomes, roses, and gunnera. Rusty the Moosey dog makes a real splash in the pond in December! There's absolutely no charge for the Moosey Calendar. Just enjoy the pictures, and enjoy sharing my garden with me throughout the year. Have a peep at the images below to see what each month will bring.